This is one of those advantages of not being fully licensed. Upper Deck announced Tuesday that it will include “Shoeless” Joe Jackson in its 2010 Goudey baseball card set, which is scheduled to arrive on March 16. The set will include cards of Jackson as well as game-used bat cards and will be the first of a few 2010 Upper Deck products to include the disgraced star. The highest-profile player in the 1919 Black Sox scandal where the Chicago White Sox threw the World Series, “Shoeless Joe,” appears on just 209 baseball cards and nearly a quarter of those were made unlicensed by Donruss in 2008. Jackson and all other players on Major League Baseball’s ineligible list cannot appear on baseball cards licensed by MLB Properties. However, Upper Deck did include a bat card of Jackson (his first memorabilia card; above) in its 2001 SP Legendary Cuts set, which ruffled some MLB feathers at the time. Chris Olds is the editor of Beckett Baseball and Beckett Graded Card Investor. Have a comment, question or idea? Send an e-mail to him at colds@beckett.com. There are plenty of scandals and black eyes for baseball through the years but today is the day, albeit 90 years ago, that one of the most egregious tales officially began. The Black Sox — the throwing of the 1919 World Series by the Chicago White Sox. Eight players — Joe Jackson, Eddie Cicotte, Lefty Williams, Chick Gandil, Fred McMullen, Swede Risberg, Happy Felsch and Buck Weaver — were banned from the game for life, added to baseball’s ineligible list for their involvement in or knowledge of the fix. 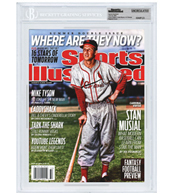 And because those players are on the ineligible list, they have largely been unseen on modern-day baseball cards because they are ineligible to appear on any cards licensed by Major League Baseball. An example of Monty Sheldon's sketch cards -- a past Sheldon’s Sketch Card Champions card of "Shoeless" Joe Jackson. Noted baseball artist Monty Sheldon is commemorating the 90th anniversary of the Black Sox scandal with a series of eight hand-drawn and intricately detailed pencil sketch cards that he will complete, unveil and sell on the anniversary of each game from the 1919 World Series. His “Eight Men Out” concept is an interesting piece of self-promotion — he already sells his Sheldon’s Sketch Card Champions cards, which are part of a larger set weekly on eBay (user rube77) — but this project will acknowledge the history of the game and, with the auctions’ subjects and timing, also perhaps bring some attention to one of baseball’s more interesting stories. But it’s also a project that ties into his creative past. “When I first started painting on baseballs back in 1998, I knew the following year would be the 80th anniversary of the Black Sox scandal, and I finished painting a baseball of each player to correspond with each game’s date,” Sheldon said on Friday afternoon. “Back then, that group of baseballs proved to be quite popular when I would display them at the card shows. Jerry Herrin of All-Star Sports & Collectibles in Byron, Ga., wanted to let Beckett readers know all about a significant pull found in his shop from this year’s SP Legendary Cuts — a dual autograph of Charles Comiskey, former owner of the Chicago White Sox and Arnold Rothstein, the man believed to be behind the fix in the 1919 World Series.